When one thinks of bird migrations, it’s usually a north-south route that follows seasonal climates. But researchers in the Amazon have tracked, for the first time, a largely-unknown long-distance migration that sticks entirely to the Amazon Basin. Using satellite telemetry, scientists tracked a pair of Orinoco geese (Neochen jubata) from Peru and a male from Western Brazil, who both migrated to the Llanos de Moxos, a vast savanna and Amazonian watershed in Bolivia. 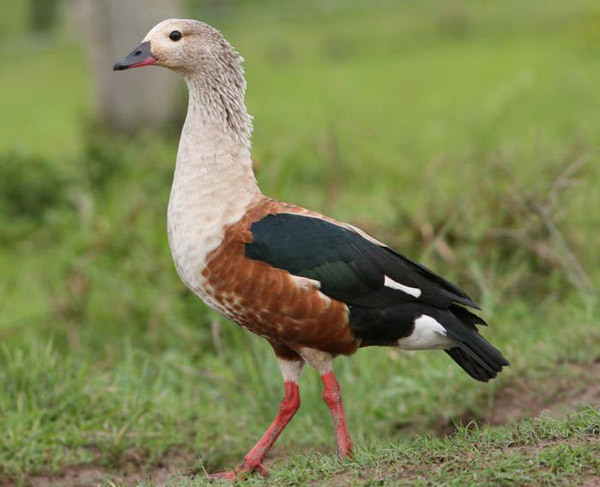 The research has shown that the Orinoco geese—which breeds in both Peru and Brazil—depends on wetlands in the Llanos de Moxos for much of the year. 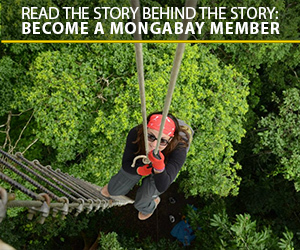 “Our bird tagged in Brazil spent nearly nine months in Bolivia after breeding season in Brazil ended. The Peruvian birds may spend more time in Peru, but we haven’t yet tracked any birds for a full 12 month cycle, so we are waiting for more results on birds tagged in Peru just now—hoping to get a longer dataset this time,” explains Lisa Davenport with Duke University Center for Tropical Conservation, who worked on tracking the birds. The tracked male flew around 950 kilometers and usually at night. The Orinoco goose is currently classified as Near Threatened by the IUCN Red List with its population having dropped an estimated 40-75 percent between 1993 and 2004. Habitat loss and overhunting are thought to be the major contributors to the population drop. “Hunting has decimated many populations [of Orinoco goose] and any migratory bird is in danger during migration, so I do worry especially about the Peruvian population that migrated by traveling down large sections of the Rio Madre de Dios with lots of gold-miners, loggers, etc., and so potential to be hunted during their long migration,” says Davenport. In addition, the Llanos de Moxos, which is also known as the Beni tropical savanna, has suffered from human impacts for centuries. 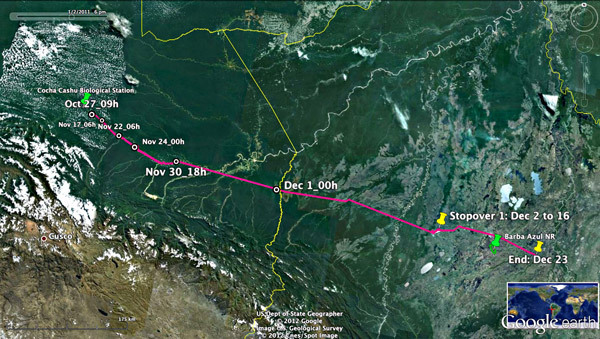 Orinoco goose migration mapped from Peru to Bolivia. Image courtesy of Lisa Davenport. 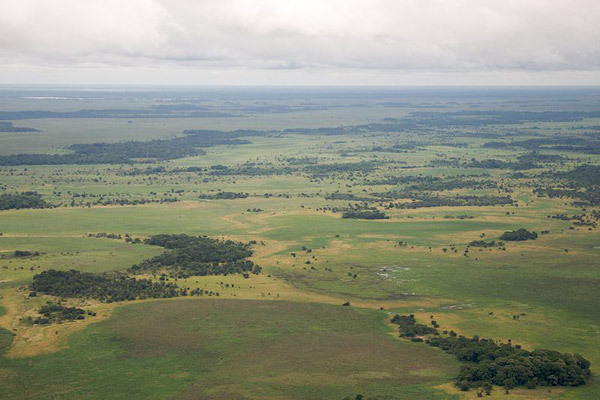 “The Llanos de Moxos […] undergoes obvious threats like yearly grassland burning and habitat destruction with ploughed under savannas being planted with monoculture Africanized grass. This is what we can see. But I think a much worse destruction has happened through hundreds of years of cattle overgrazing. This falls within the Shifting Baseline Syndrome where we, whether naturalists or scientists perceive the cattle ranching as relatively harmless. But we are not seeing, we are not quantifying, the vast reduction in old growth trees throughout an area twice the size of Portugal,” explains Bennett Hennessey, a biologist who heads the Asociacion Armonia in Bolivia. Shifting baselines refers to the fact that knowledge about the state of an environment is lost over time either due to generational gaps or even to faulty memory. For example, what looks like a natural ecosystem to a current generation today may look hugely degraded to past generations. Hennessey also notes a rising threat to the Llanos de Moxos: the soya industry for biofuels. “[Llanos de Moxos] has not been hit yet by this devastating blow, but the area is in their sights,” he says. Earlier this year the Llanos de Moxos was listed under under the Ramsar Convention’s Wetlands of International Importance. However, Hennessey says this will have little practical import for the ecosystems protection. But the fate of the Orinoco goose now appears dependent on the fate of Bolivia’s great savanna. Discovering the Orinoco goose’s hidden migration points to the possibility that more bird species migrate entirely within the vast Amazon Basin, but at this point researchers simply don’t know. “When we conduct a bird study in an area, we almost never record a bird as a vagrant—because we do not know when specific birds are out of their normal range,” says Hennessey. Basic research on bird species, such as migration patterns, simply haven’t occurred for many Amazon species. Around 1,500 birds are from the Amazon region–and more are discovered every year–which is nearly 600 more species than found in the U.S.
“There is still so much we do not know and this kind of shocking research demonstrates how we should tread carefully in our assumptions on ecological systems,” notes Hennessey. Oronico goose in Venezuela. Photo by: Tom Friedel/Creative Commons 3.0. Aerial view of Llanos de Moxos. Photo by: Sam Bebee/Creative Commons 2.0. (09/11/2013) Birds are providing a valuable ecosystem service on coffee plantations in Costa Rica, finds a new study that quantifies the pest control benefits of preserving tree cover in agricultural areas. The study, published in the journal Ecology Letters, looked at the impact of the coffee berry borer beetle (Hypothenemus hampeii) on coffee yields. The beetle is the only insect that directly consumes coffee berries, making it a major scourge for coffee farmers around the world, costing producers some $500 million a year. (09/11/2013) As the illegal poaching of African elephants and rhinos reaches epidemic levels, other species are also suffering catastrophic losses as a direct result of poachers’ behavior. A recent incident in July, where a poisoned elephant carcass led to the death of 600 vultures near Namibia’s Bwabwata National Park, has highlighted how poachers’ use of poison is now one of the primary threats to vulture populations. (09/03/2013) The Blakiston fish owl (Bubo Blakistoni) is the world’s largest – and one of the rarest – owl species, with an impressive 6 foot (2 meter) wingspan. The giant owl, found exclusively in northeast Asia, shares its habitat with a menagerie of endangered and impressive animals, including Amur tigers, Amur leopards, Asiatic black bears and wild boars.